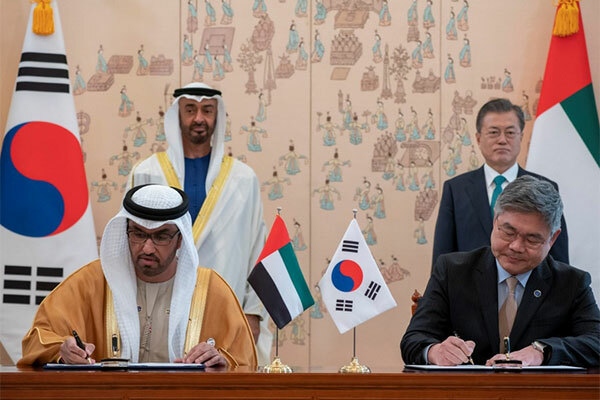 The UAE and South Korea have signed a number of agreements covering the areas of double taxation avoidance, "strategic dialogue", tourism, smart agriculture and the environment, as well as investment, industrial cooperation. The agreements also covered the promotion of cleaner production concepts and applications and the "Hydrogen City", reported Emirates news agency Wam. Sheikh Mohamed bin Zayed Al Nahyan, Crown Prince of Abu Dhabi and Deputy Supreme Commander of the UAE Armed Forces, and President Moon Jae-in of South Korea, attended the signing of agreements and memoranda of understanding (MoU) between the UAE and the Republic of Korea at the Blue House in Seoul. The agreements aim to enhance strategic cooperation between the two friendly countries and expand its horizons to achieve the mutual interests of both countries. The signed agreements and MoUs included an agreement to avoid double taxation and prevent tax evasion between the governments of the United Arab Emirates and the Republic of Korea. It was signed by Dr Anwar bin Mohammed Gargash, UAE Minister of State for Foreign Affairs, and Kang Kyung-wha, South Korean Foreign Minister. Another MoU was also signed by the UAE Minister of State for Foreign Affairs and the Korean Foreign Minister on the Special Strategic Dialogue between the Ministry of Foreign Affairs and International Cooperation and its Korean counterpart. Also an MoU was signed, in the field of tourism, between the UAE Ministry of Economy and the Korean Ministry of Culture, Sports and Tourism in Korea. It was signed by the UAE Minister of State for Foreign Affairs and the Korean Minister of Culture, Sports and Tourism. Dr Thani bin Ahmed Al Zeyoudi, Minister of Climate Change and Environment, and the South Korean Minister of Agriculture, Food and Rural Affairs signed a Memorandum of Understanding on cooperation in the field of smart agriculture. The UAE Minister of Climate Change and the Environment and the President of Korea National Cleaner Production Centre also signed an MoU on the promotion of cleaner production concepts and environmental applications. The agreements and MoUs signed by the two countries also included an MoU between the UAE government and the Korean Ministry of Trade, Industry and Energy on cooperation in the fields of industry and investment. It was signed by Dr. Sultan bin Ahmad Sultan Al Jaber, UAE Minister of State, and Korean Minister of Commerce, Industry and Energy. In addition, another MoU between the UAE government and the Korean Ministry of Land, Infrastructure and Transport to enhance industrial and investment cooperation in the field of "Hydrogen Cities". The MoU was signed by Dr Al Jaber and the Korean Minister of Land, Infrastructure and Transport.